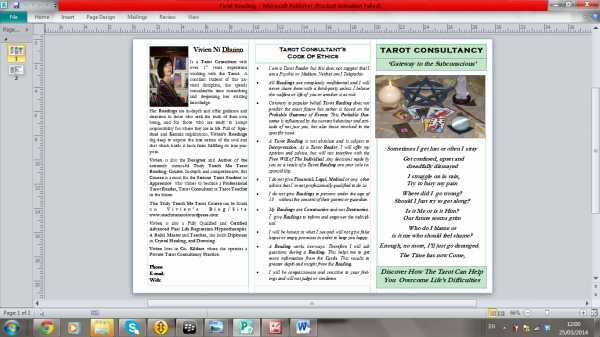 As it is not possible for me to upload the actual Tarot Brochure itself via WordPress, I have taken a Screenshot of the Front and Back of the Brochure which is then folded in Three. This Brochure was created using Microsoft Office Publisher but there are several On-Line Companies offering Brochure Creating Facilities. Below the Screen-Shots I have supplied the Brochure Text. 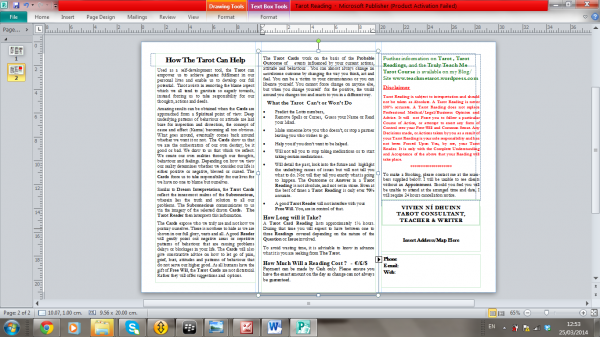 This should give you an idea of what you might like to put in your Brochure. If you would like to base your Brochure on mine that is fine and all you will have to do is change Name, Contact Details and Photograph etc. Obviously you will need to write your own Personal Bio to let people know about you. I have a lot of content in my Brochure as I am A Tarot Consultant which you may not feel is necessary, so you can adapt it to suit your needs. 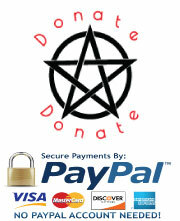 Is a Tarot Consultant with over 17 year’s experience working with the Tarot. A constant student of this ancient discipline, she spends considerable time researching and deepening her existing knowledge. Her Readings are in-depth and offer guidance and direction to those who seek the truth of their own being, and for those who are ready to accept responsibility for where they are in life. Full of Spiritual and Karmic implications, Vivien’s Readings dig deep to expose the true nature of the soul and that which holds it back from fulfilling its true purpose. 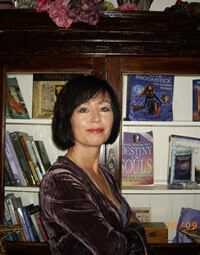 Vivien is also the Creator and Author of the extremely successful Truly Teach Me Tarot Reading Course. In-depth and comprehensive, this Course is a must for The Serious Tarot Student or Apprentice who wishes to become a Professional Tarot Reader, Tarot Consultant or Tarot Teacher in the future. Vivien is also a Fully Qualified and Certified Advanced Past Life Regression Hypnotherapist. A Reiki Master and Teacher, she holds Diplomas in Crystal Healing, and Dowsing. Vivien lives in Co. Kildare where she operates a Private Tarot Consultancy Practice. I am a Tarot Reader but this does not suggest that I am a Psychic or Medium. Neither am I Telepathic. All Readings are completely confidential and I will never share them with a third-party unless I believe the welfare or life of you or another is at risk. Contrary to popular belief, Tarot Reading does not predict the exact future but rather is based on the Probable Outcome of Events. This Probable Outcome is influenced by the current behaviour and attitude of not just you, but also those involved in the specific issue. A Tarot Reading is not absolute and is subject to Interpretation. As a Tarot Reader, I will offer my opinion and advice, but will not interfere with the Free Will of The Individual. Any decisions made by you as a result of a Tarot Reading are your sole responsibility. I do not give Financial, Legal, Medical or any other advice that I’m not professionally qualified to do so. I do not give Readings to persons under the age of 18 without the consent of their parent or guardian. My Readings are Constructive and not Destructive. I give Readings to inform and empower the individual. I will be honest in what I see and will not give false hopes or empty promises in order to keep you happy. A Reading works two-ways. Therefore I will ask questions during a Reading. This helps me to get more information from the Cards. This results in greater depth and insight from the Reading. I will be compassionate and sensitive to your feelings and will not judge or condemn. I do not predict the Lotto Numbers. Neither do I Invoke/Remove Spells or Curses. I reserve the right to Refuse or Discontinue a Reading should I feel it necessary to do so. Where did I go wrong? Should I Just try to get along? Who do I blame or is it me who should feel shame? Used as a self-development tool, the Tarot can empower us to achieve greater fulfilment in our personal lives and enable us to develop our full potential. Tarot assists in removing the blame aspect which we all tend to gravitate so eagerly towards, instead forcing us to take responsibility for our thoughts, actions and deeds. Amazing results can be obtained when the Cards are approached from a Spiritual point of view. Deep underlying patterns of behaviour or attitude are laid bare for inspection and dissection, the concept of cause and effect (Karma) becoming all too obvious. What goes around, eventually comes back around whether we want it or not. The Cards show us that we are the orchestrators of our own destiny, be it good or bad. We draw to us that which we reflect. We create our own realities through our thoughts, behaviour and feelings. Depending on how we view our reality determines whether we consider our life is either positive or negative, blessed or cursed. The Cards force us to take responsibility for our lives for we have no one to blame but ourselves. Similar to Dream Interpretation, the Tarot Cards reflect the inner-most realms of the Subconscious, wherein lies the truth and solution to all our problems. The Subconscious communicates to us via the Imagery of the Selected Drawn Cards. The Tarot Reader then interprets this information. The Cards expose who we truly are and not how we portray ourselves. There is nowhere to hide as we are shown in our full glory, warts and all. A good Reader will gently point out negative areas or repetitive patterns of behaviour that are causing problems delays or blockages in your life. The Cards will also give constructive advice on how to let go of pain, grief, hurt, attitudes and patterns of behaviour that do not serve our higher good. As all humans have the gift of Free Will, the Tarot Cards are not dictatorial. Rather they will offer suggestions and options. The Tarot Cards work on the basis of the Probable Outcome of Events influenced by your current actions, attitude and behaviour . You can almost always change an Unwelcome Outcome by changing the way you think, act and feel. You can be a victim to your circumstances or you can liberate yourself. You cannot force change on anyone else, but when you change yourself for the positive, the world around you changes too and reacts to you in a different way. Remove Spells or Curses, Guess your Name or Read your Mind. Make someone love you who doesn’t, or stop a partner leaving you who wishes to go. Help you if you don’t want to be helped. Will not tell you to stop taking medications or to force you to take certain medications. Will detail the Past, look into the Future and Highlight the underlying causes of issues, but will not tell you what to do. Nor will they tell you exactly what is going to happen. The Outcome or Answer in a Tarot Reading is Not Absolute, and not Carved in Stone. Even at the best of times a Tarot Reading is only ever 70% Accurate. A good Tarot Reader will not interfere with your Free Will. You, are in control of that. A Tarot Card Reading lasts approximately 1½ hours. During that time you will expect to have between one to three Readings covered depending on the nature of the Question or Issue involved. To avoid wasting time, it is advisable to know in advance what it is you are seeking from The Tarot. Payment can be made by Cash/?/? only. Please ensure you have the exact amount on the day as change can not always be guaranteed. 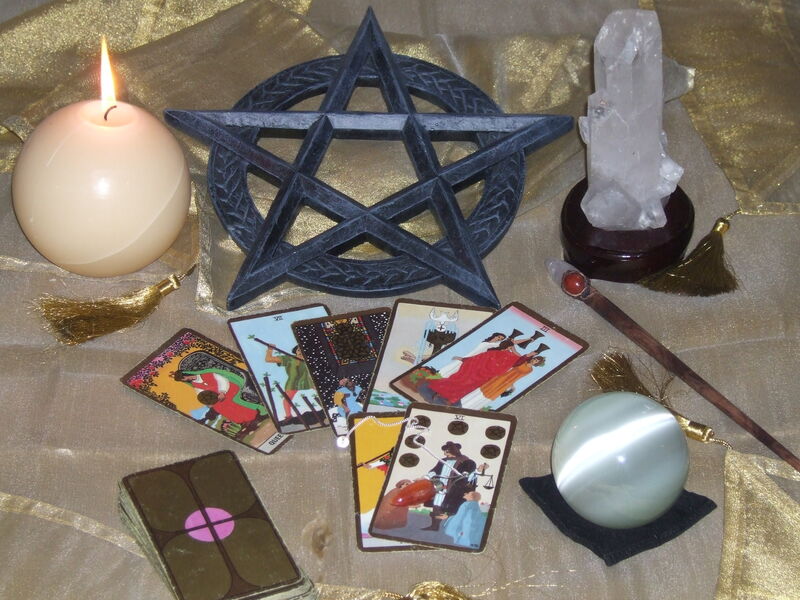 Tarot Reading is subject to interpretation and should not be taken as Absolute. A Tarot Reading is never 100% accurate. A Tarot Reading does not replace Professional Medical/Legal/Business Opinion and Advice. It will not Force you to follow a particular Course of Action, or attempt to exert any form of Control over your Free-Will and Common Sense. Any Decisions made, or Actions taken by you as a result of your Tarot Reading is your sole responsibility and has not been Forced Upon You, by me, your Tarot Reader. It is only with the Complete Understanding and Acceptance of the above that your Reading will take place. To make a Booking, please contact me at the numbers supplied below. I will be unable to see clients without an Appointment. Should you feel you will be unable to attend at the arranged time and date, I will require 24 hours cancellation notice.